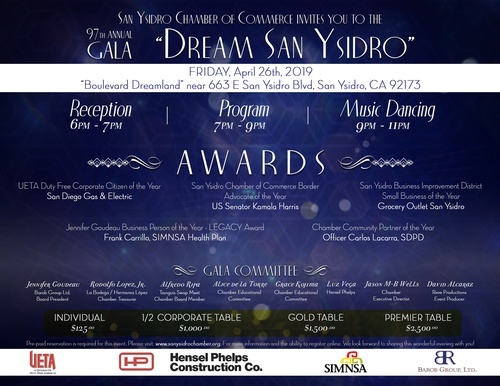 The San Ysidro Chamber of Commerce is "Puttin' on the Ritz" on San Ysidro Blvd! Join us for our 97th Annual Gala and Business Awards Show on April 26th, as we kick off "Re-imagine the Boulevard!" - the Chamber's efforts to redevelop San Ysidro's backbone. Putting our "money where our mouth is," all guests will arrive through a traffic-less route to San Ysidro, have free valet parking, and be shuttled to a beautiful, Hollywood-style red carpet that will lead them to a vegetation-walled reception, before entering an elegant fusion of lighting, sensory teasing and glamour for the dinner and program! Friday, April 26th. An open-bar reception will begin at 6:00pm, with the official program and dinner at 7pm.